Kiev (Kyiv) is one of the most beautiful cities in Europe. Whatever you may be looking for, be it business or pleasure, Kiev hotels, attractions, culture and architecture are sure to supersede your expectations. Founded 1500 years ago, Kiev is the bustling capital of newly independent Ukraine. Modern Kiev is a mix of the old and the new, seen in everything from the architecture and stores to the Kiev hotels and especially to the people themselves. Along with Ukrainian independence many other changes have started to take place, such as the opening of Western-style residential complexes, modern nightclubs, classy restaurants and Kiev hotels. The centre of Kiev has been cleaned up and buildings have been restored and redecorated, especially the Khreshchatyk street and the Independence Square. Many historic areas of Kiev, such as Andriyivskyy Descent, have become popular street vendor locations, where one can find traditional Ukrainian art, religious items, books, game sets as well as jewelry for sale. The majority of the State owned Kiev hotels are notorious for their poor service and inadequate ability to provide for the dynamic changes in the hotel industry. There are however a couple of high class hotels, namely the Premier Palace and the Hyatt Regency, both of which are extremely expensive. The best Kiev hotel to offer both luxury and excellent service can be found in the centre of town and is known as the City Park Hotel Kiev. This Kiev hotel prides itself on offering exceptional value for money, a wide variety of rooms, exquisite food and beverage and is located in the cultural historical centre of Kiev. 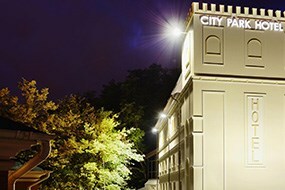 The City Park Hotel Kiev is perfect for both business and pleasure and the hotel offers various packages to suit all travelers. Kiev was the historic cultural centre of the East Slavic civilization and retained its standing as such through the centuries. Its sacred sites, which include the Kiev Pechersk Lavra (the Monastery of the Caves) and the Saint Sophia Cathedral, attracted pilgrims for centuries and are now recognized as UNESCO World Heritage Sites. 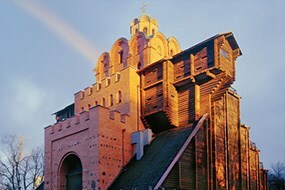 The above mentioned sites are also part of the Seven Wonders of Ukraine collection. 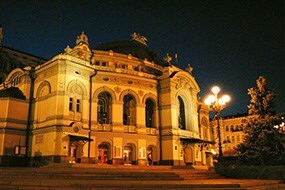 An important part of Kiev's culture is the many theatres in the city, which include: Kiev Opera House, Ivan Franko National Academic Drama Theatre, Lesya Ukrainka National Academic Theater of Russian Drama, the Kiev Puppet Theater, October Palace, National Philharmonic of Ukraine and many others. Other significant cultural centres include the Dovzhenko Film Studios, and the Kiev Circus. The most important of the city's many museums are the Kiev State Historical Museum, Museum of the Great Patriotic War, the National Art Museum, the Museum of Western and Oriental Art, the Pinchuk Art Centre and the National Museum of Russian art. Kiev is well known for its historical architectural landmarks which include the Mariyinsky Palace, several Orthodox churches such as St. Michael's Cathedral, St. Andrew's, St. Vladimir's, the reconstructed Golden Gate, quaint Kiev hotels and others. One of Kiev's widely recognized modern landmarks is the highly visible giant Mother Motherland statue made of titanium standing at the Museum of the Great Patriotic War on the Right bank of the Dnieper River. 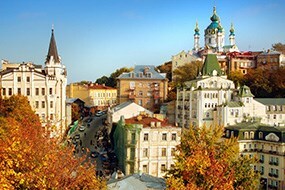 Kiev is known as a green city with two botanical gardens and numerous large and small parks. The green nature of the city is probably most notable by the green hills of the right bank along the Dnieper River that have been relatively untouched by development. The World War II Museum is located here, which offers both indoor and outdoor displays of military history and equipment surrounded by verdant hills overlooking the Dnieper River. Among the numerous islands, Venetsianskyi (or Hidropark) is the most developed. It is accessible by metro or by car, and includes an amusement park, swimming beaches, boat rentals, and night clubs. The Victory Park (Park Peremohy) is a popular destination for strollers, joggers, and cyclists. Boating, fishing, and water sports are popular pastimes in Kiev. The area lakes and rivers freeze over in the winter and ice fishermen are a frequent sight, as are children with their ice skates. However, the peak of summer draws out a greater mass of people to the shores for swimming or sunbathing, with daytime high temperatures sometimes reaching 30 to 34°C (86-93°F). 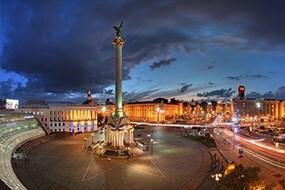 The centre of Kiev (Independence Square and Khreschatyk Street) becomes a large outdoor party place at night during summer months, with thousands of people having a good time in nearby restaurants, clubs, outdoor cafes and Kiev hotels. The central streets are closed to traffic on weekends and holidays. Andriyivskyy Descent is one of the best known historic streets and a major tourist attraction in Kiev.